PDX with a Calabrian twist. 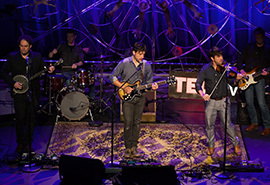 A musical product of the creative melting pot of Portland, Mbrascatu is an indie rock band that draws from diverse European and American roots to create a uniquely signature sound. Blending together dynamics ranging from delicate to explosive; expressive Italian lyrics; hook-laden melodies; inventive arrangements; and energetic rhythms to dance to; the band has performed extensively throughout the Pacific Northwest, delighting audiences at the hottest music venues, outdoor festivals, bars, clubs and local radio stations. Members include Andrea Algieri (guitar, vocals); Dylan Dean (violin, viola, vocals); John Sabestinas (electric guitar, banjo, ukulele, lap steel, vocals); Tim Anderson (bass guitar); and Mark Powers (drums). Read more about Mbrascatu on our blog.